Shuri (to Agent Ross): Don't scare me like that, colonizer! 9.3.2018 Don’t scare me like that, colonizer! 8.3.2018 What can a nation of farmers have to offer…? T'Challa (to Shuri): I bought this building. And that building. And that one over there. This will be the first Wakanda International Outreach Center. Nakia will oversee the social outreach. And you will spearhead the Science and Information Exchange. 8.3.2018 The first Wakanda International Outreach Center. Shuri (to T'Challa): When you said you would take me to California for the first time, I thought you meant Coachella or Disneyland. 8.3.2018 I thought you meant Coachella or Disneyland. 8.3.2018 I know a way you can still fulfill your calling. Please stay. Erik Killmonger (to T'Challa): Pops said Wakanda was the most beautiful thing he ever seen. He promised he was gonna show it to me one day. Can you believe that? Kid from Oakland running around believing in fairy tales. (T'Challa brings him on a mountain to see it) It's beautiful. 8.3.2018 Wakanda was the most beautiful thing he ever seen. W'Kabi: Would you kill me, my love? Okoye: For Wakanda? Without question. 8.3.2018 Would you kill me? – For Wakanda? Without question. Shuri: Don't worry, I'll guide you through it. It's just like riding a hoverbike. Everett Ross: What? You guys have hoverbikes? 8.3.2018 It’s just like riding a hoverbike. T'Challa: Please allow my mother to stay here. M'Baku: No harm will come to her. I give you my word. T'Challa: You know, I could use an army as well. 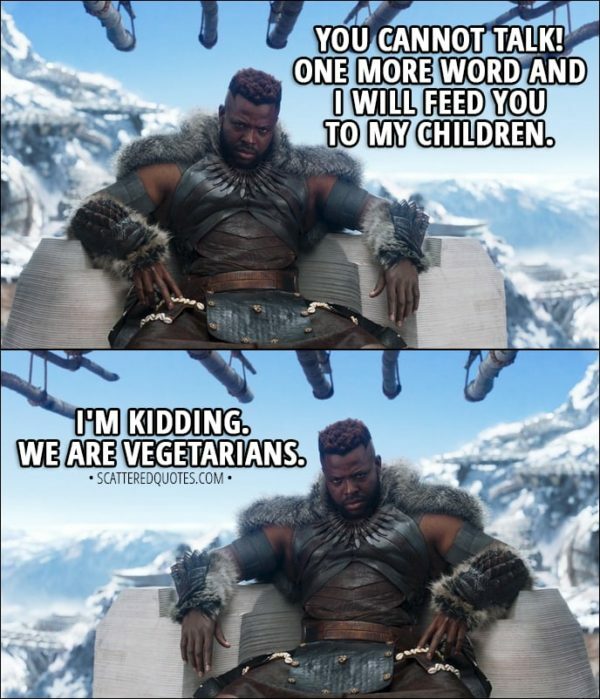 M'Baku: I bet you could. But no. 8.3.2018 I could use an army as well. – I bet you could. But no. Ramonda: T'Challa, we will not leave Wakanda. T'Challa: It is my duty to keep you safe. Shuri: If he gets control of our technology, nowhere will be safe. The Black Panther lives. 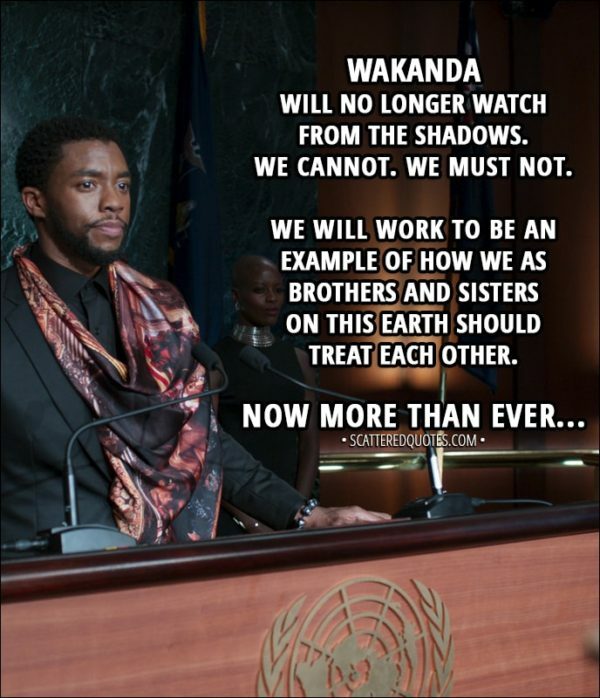 And when he fights for the fate of Wakanda, I will be right there beside him. Everett Ross: I'm in too. What? You're gonna need all the help you can get. M'Baku: (yawns) Are you're done? A-Are you-are you- are you done? 8.3.2018 The Black Panther lives. I will be right there beside him. 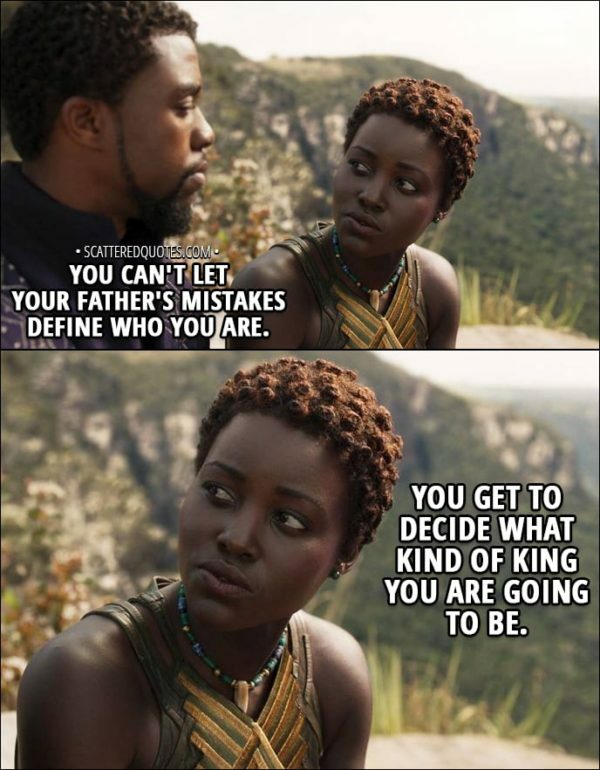 T'Challa (to T'Chaka): You were wrong! All of you were wrong! To turn your backs on the rest of the world! We let the fear of discovery stop us from doing what is right. No more! I cannot stay here with you. I cannot rest while he sits on the throne. He is a monster of our own making. I must take the mantle back. I must! I must right these wrongs. 8.3.2018 He is a monster of our own making. 8.3.2018 I’m kidding. We are vegetarians. Okoye: I'm not a spy who can come and go as they so choose. I am loyal to that throne, no matter who sits upon it. What are you loyal to? Nakia: I loved him. I love my country, too. Okoye: Then you serve your country. Nakia: No. I'll save my country. 8.3.2018 I am loyal to that throne, no matter who sits upon it. 8.3.2018 You get to decide what kind of king you are going to be.